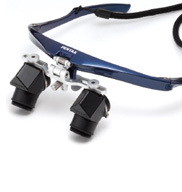 The PRISMVUE loupes are prismatic loupes incorporating PENTAX's unique deflection prisms and offer the surgeon with bright magnified view of the operation field while maintaining upright posture and facing forward. It prevents the user from needing to hunching their neck and back forward. 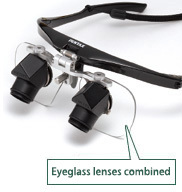 PENTAX's unique deflection prisms allow the surgeon to magnify the operation field while standing upright and facing forward. PENTAX's unique and sophisticated design provides a bright and wide field of view. The upright posture facing forward during operation prevents the user's head from interfering with the surgical lights and ensures a bright field of view at all times. that obtained with conventional products. *Note: Convergence is the eyes' turning inward towards the nose when we view objects with both eyes. 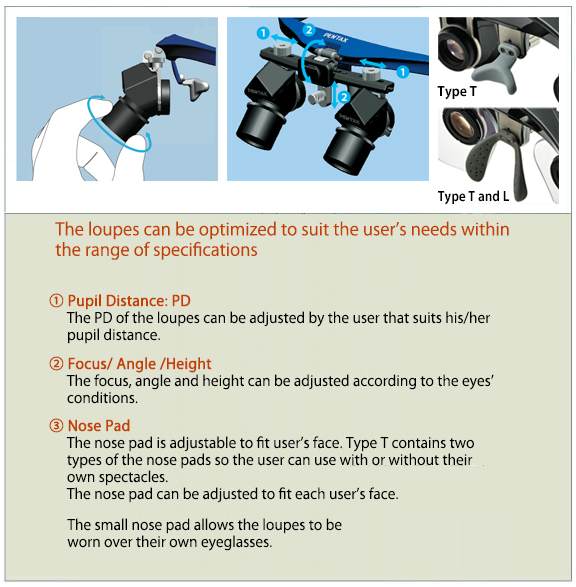 Our loupes allows the user to switch easily between magnified and actual size view by just moving the head and only from the movement of the eyes. This allows stabilization of the magnified viewing position. *High-refractive-index aspherical lenses are incorporated in eyeglasses for Type L.
※Weight may vary depending on the degrees of the eyeglass lenses.